This is a seldom openly discussed but important part of salmon fly fishing set up so here's my own analysis of the facts as far as I see it on weight and length of salmon leader and which leader material will never let you down. Firstly I think it's very important to understand that if a salmon is seeing your leader after fishing down through a pool then the fish has already ignored your offering! The weight or bulk of a salmon fly leader is of little relevance in Scottish salmon fishing unless you're in exceptionally difficult low clear warm water conditions and using the tiniest of Summer salmon flies. Only then would I ever be down using a 10lbs or 12lbs leader just so I can thread the eye of the fly and pare the presentation down for subtlety reasons. The bulk and weight of a salmon fly leader should be selected based on the bulk and weight of the salmon fly being used. The art of effectively & effortlessly 'turning over' a salmon fly is 100% to do with energy transfer to the fly after the forward delivery power stroke of the cast has been applied. In other words a very light or limp leader will struggle to make that energy transfer effective all the way to a salmon fly if the leader has not been selected with the bulk and weight of the salmon fly in mind. The length of the leader should be dictated by the depth you're trying to fish the fly at. In other words you don't want to be fishing with a 10ft leader if you're fishing a sinking tip as the tip will certainly do its job however the fly will be riding higher in the water column. In this situation a shorter leader will keep the fly down where you're really intending it to be in the water column when using a sink tip. Personally I like 18lbs test for the majority of my fly fishing when normal sized 7's, 9's or even 11's are the order of the day. With heavier tubes I'll move up to 25lbs test (for 'bullet like' turnover) or with much small flies I'll seldom go below 12lbs test on the bigger Scottish river where there's always a fair chance of a heavyweight interception! For sinking tips or full sinking fly lines I'd shorten my leader right down to as little as 3ft with a very heavy 'type 7' (or heavier) tip or to a 4ft to 5ft leader length with a regular 'type 3' tip as again you don't want your sink tip down and the salmon fly riding higher which it will do with a longer leader. Keeping different leader weight material coiled up in your fly box is wise so you know you've always got spares if you lose your leader as forgetting a leader spool is easy but its unnecessary to carry the entire leader spool about with you. Since I started salmon fishing in the 70's I've never strayed away from good old Maxima Chameleon leader material. The reason for this can be summed up in one word and that word is 'reliability'. 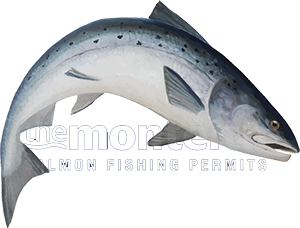 The link between your rod and the hard earned hook hold in a salmon's mouth needs to be as good as you can get as if there's a weak spot anywhere in your fishing line a salmon will undoubtedly find it! I've seen so many expensive leader materials break just due to the normal strain of a salmon battle or due to an unnoticed wind knot but when you're fishing with Maxima you've got absolutely nothing to worry about!